Advances on the thin client work are promising. Running the software with a much newer version of Linux and X drivers is going to reap some big benefits for us. Initially the new image would not upload into FOG, so I worked using Clonezilla which takes longer to replicate to additional workstations. I'm working on a master build on the 5745 model, and then clone it and push it down to 5725s and test everything fully on both models and ensure that everything works. My coworker Brian had set up FOG and tinkered with the reason why it would not upload and finally found the issue. There were reports that others had the same problem, and the solution was to boot the thin client with a recovery DVD and basically fsck the drive and that repaired the issue. For whatever reason, FOG did not like the default HP file system as shipped and now it's working like a champ. So now I can push updates to multiple devices easily over the network, a real time saver. I have been having luck so far finding some PPAs that fix certain bugs and driver issues and making progress on both models. The newer X drivers are much more friendly to monitor rotations and I was able to get a dual screen, landscape and portrait configuration working responsively. So it looks like we'll be able to offer that as a feature to end users. 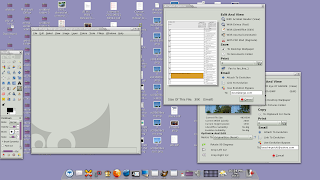 The older Debian release years ago was buggy in regards to monitors and rotations. I also have started to test two portrait monitors side by side and that's coming along too. Thankfully our hardware diversity is low by design, so after testing with a sample group it should deploy nicely to everyone else. Next up will be testing Xinerama with three and four monitors to see how they work and see if they can be deployed into production. Our progression in years past was that we ran compiz over remote display and this worked only in 16bit color. Our users needed higher color depth and so a few years ago when we upgraded we disabled desktop effects and put everyone into 24 bit color. An unexpected pleasure was that obviously a lot of work has been done in this area, and I was able to enable metacity compositing in 24bit color (shot below) and it's working! That also allowed me to unflatten the avant-window-navigator as well and that too seems responsive on both models. So I'm packing up a build with these changes and pushing it to our IT test users and see how it works. It sure looks a lot nicer, hopefully this feature will not present any problems and make the final cut. I'm hopeful to get this out past just IT staff next week for testing and I'll continue testing and making improvements. Other projects: A vendor contacted us with a product that allows you to connect iPads to the GNOME desktop over low bandwidth, I'll blog about that when it's advanced. I'm looking over setting up a LDAP server for various software packages. Various questions and support issues.